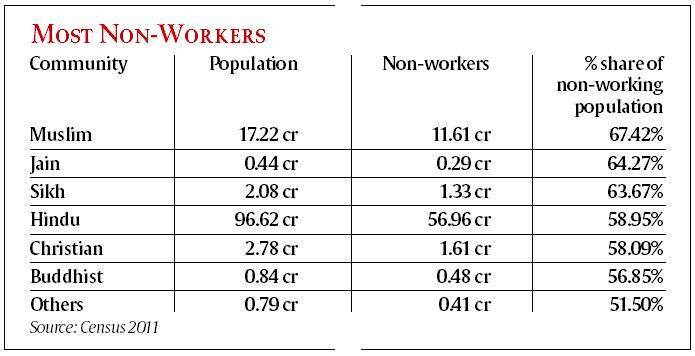 The total 72.89 crore Indians have been listed as non-workers — 60.20% of the total population of 121.08 crore. The percentage of the non-working population is highest among Muslims in the country, according to data released by the Census office on Tuesday. 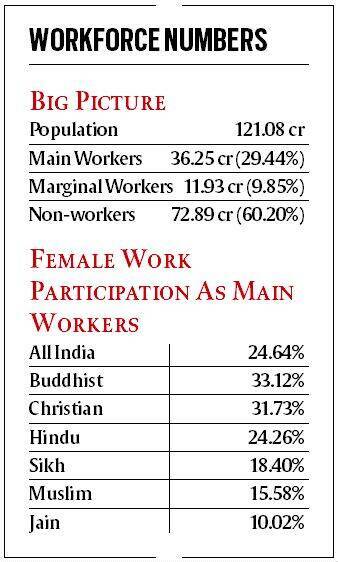 A massive 11.61 crore Muslims — who make up 67.42% of the 17.22 crore Muslim community — have been listed as non-workers. The total 72.89 crore Indians have been listed as non-workers — 60.20% of the total population of 121.08 crore. Non-workers are defined as those who do not participate in any economic activity — paid or unpaid, household duties, or cultivation. Following Muslims in the list of communities with the largest share of non-workers are Jains. There are 0.29 crore non-working Jains, who make up 64.47% of the total Jain population. After them are Sikhs (63.76%), Hindus (58.95%), Christians (58.09%), Buddhists (56.85%) and Others (51.50%). An analysis of the Census records shows that the percentage share of non-workers fell slightly between 2001 and 2011. In 2001, out of a total population of 102.8 crore, 62.63 crore were registered as non-workers — making up 60.88% of the population. In 2011, the number of non-workers has gone up to 72.88 crore, but they now make up 60.2% of the total 121.05 crore population. The large number of Muslim non-workers has been blamed on the lack of adequate employment opportunities, and an exceptionally skewed work participation ratio between men and women. Women make up only 15.58% of the community’s main total working population. The participation of women in the main workforce in India is 24.64%. The only community where more women are confined to their homes are Jains — where the participation of women as main workers is just 10.02%. “A low work participation rate generally does not mean that a community is poor. It is seen that work participation is higher in communities that are poor and backward. In the case of Muslims, there is a huge distortion… A large section of the community prefers that its women stay at home, which is one reason for low work participation,” Dr Abdul Shaban, deputy director, TISS, said. Economists are split on why the number of non-workers in the economy is on the rise, but are unanimous that it is not a healthy trend for a growing economy. “In India traditionally, the participation of women in the workforce has been low. There is some evidence that if the household income goes up women generally withdraw themselves from the workforce,” Dr Pronab Sen, former chairman of the National Statistical Commission had said earlier.